Cranberry Corner: My Dad Called Me a "Saucy Lady"
The kids had dentist appointments today, so we went and did that, and when we came home I had a few hours before piano lessons to get the sauce started. I used a recipe called "All-Purpose Tomato Sauce" from Canning for a New Generation, by Liana Krisoff. I'd never canned tomato sauce before, though I always make it from scratch (or in the winter, at least from canned tomatoes.) This recipe is a basic tomato sauce that can be herbed up for spaghetti sauce or pizza sauce or enchilada sauce. And it smelled heavenly. Each batch made 4 pints, but I couldn't ever see myself wanting just a pint of sauce, so I used quart jars instead. 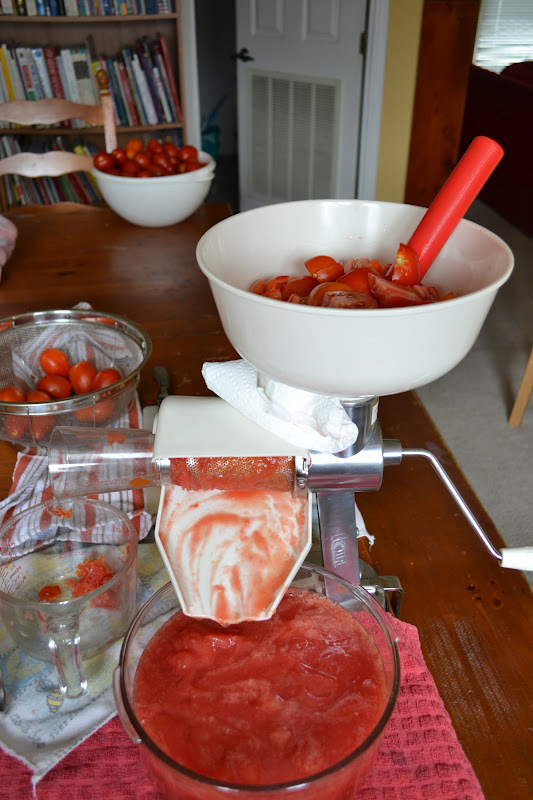 I washed the tomatoes and cut them in quarters and the boys ran them through the food mill for me. Each batch needed 12 cups of tomato puree. For two batches we used about 26 pounds of tomatoes. In a large pot, I added a tablespoon or so of olive oil and sauteed two onions until translucent. Here are the tomatoes going through the works. Then I added three or four cloves of garlic to the onions, sauteed them just for a minute and poured in the tomato puree, bringing it to a boil, and then reducing to a simmer. You can see in the beginning there is a lot of water in the tomatoes. That needs to simmer down and reduce until it's thickened up. I let it simmer for about an hour and a half. Maybe two, I'm not sure. But you can tell when it's done because it gets thicker (like tomato sauce!) and the color gets darker. This is just about done now. I sterilized the jars in the dishwasher while the sauce was simmering. Then into each quart jar I put a teaspoon of citric acid to boost the acid content and keep the color fresh. Then I just filled the jars, leaving 1/2" headspace, wiped the rims, and put the lids and rings on them. Into the water bath they went, which was brought to a boil and then processed for 35 minutes. There they are, cooling on the counter! Hard to believe it took nearly 30 pounds of tomatoes to get just four quarts and a half pint (I'm calling that one pizza sauce) of sauce! But, oh, it will be so good! And I still have about 12 pounds left that I'm thinking of turning into salsa. Easy, peasy! And I made it all by myself. From seedling to sauce. You've inspired me once more! I want to do this, it looks so yummy. After I saw your posts about jam I made a bunch of strawberry jam and I now want to can everything! Thanks for the inspiration and directions.